If you like your music with an edge, then X2005 is for you! Delivering the year's biggest hits in Christian rock, it features chart toppers from Kutless, Pillar, Skillet, Switchfoot, Hawk Nelson, Superchic(k), Thousand Foot Krutch and stacks more! 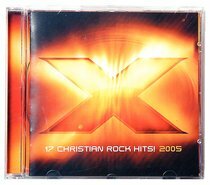 About "X2005 Christian Rock Hits"